The Apple iPad 2 is on its way, but as Which? saw at recent technology shows, there are plenty of other exciting tablets on the horizon, too. We’ve rounded-up ten of the best Android tablets unveiled at the Consumer Electronics Show (CES) and Mobile World Congress (MWC). Hot on the heels of its first tablet, the Galaxy Tab, Samsung announced the Galaxy Tab 10.1 at MWC. Unlike its predecessor, this one runs the latest version of the Android operating system: Android 3.0 or Honeycomb. Samsung claims that the new Tab 10.1 weighs 599g, which is considerably lighter than the Apple iPad. The Tab 10.1 will have a rear-facing 8Mp camera and a front-facing 2Mp camera for self portraits and video calling. Motorola officially unveiled what it called the world’s first Android 3.0 (Honeycomb) tablet at CES 2011. It’s a similar size to the iPad, with a 10.1-inch screen. The inclusion of a dual-core processor provides faster streaming and downloads and it’s noticeably quicker than the competition. There’s 32GB of on-board storage, too. Read our first look Motorola Xoom review. Toshiba’s tablet will run Honeycomb OS and has a replaceable battery. Toshiba’s latest entrant into the tablet market promises great screen quality and a replaceable battery. Another tablet to run Android Honeycomb, Toshiba’s catchily-named Tablet uses the manufacturer’s Resolution+ software – common to Toshiba’s TVs – that’s designed to improve image quality and enhance standard definition video to make it appear closer to high definition. The Tablet will also adjust its screen brightness to suit the lighting conditions. We got our hands on the best tablets at CES. Here’s our round-up video. Much to our surprise Dell’s Streak 7 doesn’t have Android 3.0, but runs on 2.2 instead. It’s also restricted to a lower, 800 x 480 native resolution display. There are some plus points with the screen, though. We found it to be very responsive to our finger gestures, and it uses ultra-strong ‘Gorilla Glass’ to stave away cracks and scratches if bumped or dropped. The 7-inch HTC Flyer is HTC’s first tablet. It comes with a ‘smart’ stylus, known as the HTC Scribe, which allows you to annotate emails, web pages and photos by hand. It captures audio, too, so you can play back the audio recording when reviewing notes to remind yourself of what was said. The Flyer’s ‘Kids’ application enables owners to lend the device to their children without fear of them accessing sensitive information, such as email accounts. What makes the 10-inch Eee Pad Transformer unique is its design. Unlike other tablets we’ve seen, this one comes with a detachable keyboard that effectively turns it into a netbook. It even folds into a clamshell for easy transportation, and features a touchpad for navigation without using the touchscreen. The Transformer’s screen sports a sharp 1,280 x 800 resolution, which looks fantastic, and Asus has incorporated a high-quality IPS display to improve viewing angles. The Viera Tablet comes in three sizes – 4-inch, 7-inch and 10-inch – ranging from smartphone-sized to iPad-sized. All three Viera Tablets run Android 2.2 and are intended to complement Panasonic’s Viera LCD and plasma TVs. In terms of the hardware, the lack of 3G precludes the inclusion of the standard Android Market for apps, but Panasonic has put its own Viera Market on its Tablets, full of Panasonic-endorsed apps. The 10.1-inch Acer Iconia A500 Tab is powered by a dual core Nvidia Tegra 2 processor giving it the ability to shoot and play HD video. It supports animated web content created using Flash 10.1 and in terms of wireless connectivity, there’s the usual wi-fi, 3G, Bluetooth and GPS support. The device weighs 730g but feels quite chunky in the hands – rather like a laptop’s screen removed from the keyboard. We got the chance to play with some exciting new tablets at Mobile World Congress. Find out more in our video round-up. 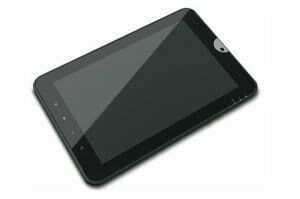 This 8.9-inch tablet is powered by a 1GHz dual core Nvidia Tegra 2 processor, which should help it playback video and games without any lag, and provide fast web access. There was some delay in the model we tried out, but it wasn’t a fully-finished device. The videos we watched looked good and the images pre-installed on the hard drive were nicely rendered and crisp. On first sight this looks like another run-of-the-mill 11.6-inch netbook. But Lenovo has far more than the netbook market in its sights. The screen can be unclasped from its hard outer-shell, becoming a touchscreen Android tablet. On the downside the interface isn’t quite as slick as the iPad and images on the screen of the model we saw were susceptible to fading if not viewed head-on.